A Z D0wN is someone who loves music. Growing up he was introduced to a cornucopia of sound via his family. “My grandparents, they liked listening to classic rock and blues,” he explained “My mom was more into sort of Top 40 stuff that was coming up in the late ’90s and early 2000s. His fashion sense leans towards the stylistically radical – with a denim vest on, decorated with pins and metal studs, along with his brightly dyed hair, he resembles a 1980s-era punk rocker, yet the sound he’s taken to in recent years is one with sensibilities that are equally futurist and retro, a style of music made by using a combination of technology. It was his enlisting in the Air Force that brought him to Missouri, and he’s recently separated from the Air Force. He’s 23 and plays multiple instruments, including guitar, mandolin, piano and synthesizers. Recently, he’s turned his creative energy and attention toward an underground genre known for more unorthodox instrumentation – he’s now doing chiptune. Chiptune is a genre in which electronic based music is made using modified Nintendo Game Boys, other musical devices and music production software. A Z D0wN cites his love for video games and a random discovery online as his reasons for getting into chiptune. 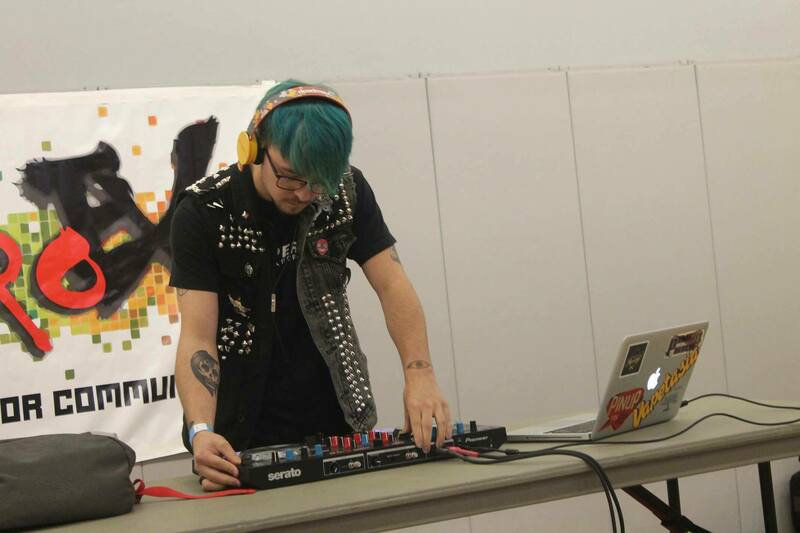 A Z D0wN’s onstage debut performance was earlier this month during Retro Ex, a convention centered around gaming, and included other pop culture facets, that took place Sep.7-9 at the University of Central Missouri. It was via association with Sean Baker, also known as Awesome Force, a fellow chiptune enthusiast and producer who had a hand in organizing the lineup of chiptune performers at Retro Ex and the after parties, that A Z D0wn was able to perform. The circumstances under which the two met pertained to A Z D0wN’s equipment purchasing habits. To procure the devices needed to make chiptune music, A Z D0wN shopped exclusively at Rock ‘N Sports Entertainment, a store in Warrensburg, Mo. that specializes in used music, DVDs, video games and video game equipment. “Sean told the guy who works at Rock ‘N Sports that he wanted to meet me because I was the guy that was buying all the Game Boys,” A Z D0wN commented. A Z D0wN is able to provide reflection on his DJ set at Retro Ex. “Everything I played that day was from a music label on You Tube called Game Chops, which is run by DJ CUTMAN. I got a hold of a bunch of music from that record label, and I sort of narrowed down what I wanted to play and make sure everything flowed together,” A Z D0wn explained. When he presented his DJ set at Retro Ex, he did so with a look of concentration on his face, as he tapped his foot in time to the electronic rhythms he was in control of. The reason for doing a DJ set mix instead of presenting his own compositions was that he has only a couple of finished chiptune pieces of his own completed. As he’s developed a love of chiptune music, A Z D0wN admits encountering difficulties when using the musical programming software in order to create the compositions. He said all that is needed to make chiptune music is a Game Boy and access to a program called LSDJ. Currently, a thriving chiptune scene does not exist in West Central Missouri, but AZ D0wN is of the opinion that generating an interest in chiptune is possible in the area.